ggplot2 is a powerful and a flexible R package, implemented by Hadley Wickham, for producing elegant graphics. The gg in ggplot2 means Grammar of Graphics, a graphic concept which describes plots by using a “grammar”. According to ggplot2 concept, a plot can be divided into different fundamental parts : Plot = data + Aesthetics + Geometry. Aesthetics is used to indicate x and y variables. It can also be used to control the color, the size or the shape of points, the height of bars, etc…..
Two main functions, for creating plots, are available in ggplot2 package : a qplot() and ggplot() functions. qplot() is a quick plot function which is easy to use for simple plots. The ggplot() function is more flexible and robust than qplot for building a plot piece by piece. The generated plot can be kept as a variable and then printed at any time using the function print(). ggsave(“plot.png”, width = 5, height = 5), which saves the last plot in the current working directory. 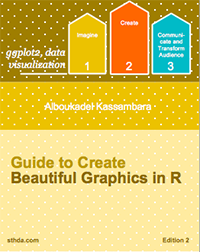 This document describes how to create and customize different types of graphs using ggplot2. Many examples of code and graphics are provided. In the current document we’ll provide the essential ggplot2 functions for drawing each of these seven data formats. How this document is organized? The data should be a data.frame (columns are variables and rows are observations). The qplot() function is very similar to the standard R plot() function. It can be used to create quickly and easily different types of graphs: scatter plots, box plots, violin plots, histogram and density plots. x, y : x and y values, respectively. The argument y is optional depending on the type of graphs to be created. Other arguments such as main, xlab and ylab can be also used to add main title and axis labels to the plot. Read more about qplot(): Quick plot with ggplot2. The R code below creates basic scatter plots using the argument geom = “point”. It’s also possible to combine different geoms (e.g. : geom = c(“point”, “smooth”)). The following R code will change the color and the shape of points by groups. The column cyl will be used as grouping variable. In other words, the color and the shape of points will be changed by the levels of cyl. This section describes briefly how to use the function ggplot(). Recall that, the concept of ggplot divides a plot into three different fundamental parts: plot = data + Aesthetics + geometry. Aesthetics: used to specify x and y variables, color, size, shape, …. Note that, some plots visualize a transformation of the original data set. In this case, an alternative way to build a layer is to use stat_*() functions. For each plot type, we’ll provide the geom_*() function and the corresponding stat_*() function (if available). We’ll use weight data (wdata), generated in the previous sections. We start by creating a plot, named a, that we’ll finish in the next section by adding a layer. Note that, by default y axis corresponds to the count of weight values. If you want to change the plot in order to have the density on y axis, the R code would be as follow. To customize the plot, the following arguments can be used: alpha, color, fill, linetype, size. Learn more here: ggplot2 area plot. To customize the plot, the following arguments can be used: alpha, color, fill, linetype, size. Learn more here: ggplot2 density plot. In a dot plot, dots are stacked with each dot representing one observation. To customize the plot, the following arguments can be used: alpha, color, fill and dotsize. Learn more here: ggplot2 dot plot. To customize the plot, the following arguments can be used: alpha, color, linetype and size. If you want to change the plot in order to have the density on y axis, the R code would be as follow. To customize the plot, the following arguments can be used: alpha, color, fill, linetype and size. Learn more here: ggplot2 histogram plot. To customize the plot, the following arguments can be used: alpha, color, linetype and size. Learn more here: ggplot2 ECDF. To customize the plot, the following arguments can be used: alpha, color, shape and size. Learn more here: ggplot2 quantile - quantile plot. To customize the plot, the following arguments can be used: alpha, color, fill, linetype and size. Learn more here: ggplot2 bar plot. We’ll use the mtcars data set. The variable cyl is used as grouping variable. We start by creating a plot, named b, that we’ll finish in the next section by adding a layer. To customize the plot, the following arguments can be used: alpha, color, fill, shape and size. Learn more here: ggplot2 scatter plot. To add a regression line on a scatter plot, the function geom_smooth() is used in combination with the argument method = lm. lm stands for linear model. Quantile lines can be used as a continuous analogue of a geom_boxplot(). We’ll use the mpg data set [in ggplot2]. We’ll use faithful data set. The function geom_jitter() is a convenient default for geom_point(position = ‘jitter’). The mpg data set [in ggplot2] is used in the following examples. width: degree of jitter in x direction. height: degree of jitter in y direction. The argument label is used to specify a vector of labels for point annotations. We start by using the diamonds data set [in ggplot2]. We start by creating a plot, named c, that we’ll finish in the next section by adding a layer. geom_bin2d() for adding a heatmap of 2d bin counts. Rectangular bining. The function geom_bin2d() produces a scatter plot with rectangular bins. The number of observations is counted in each bins and displayed as a heatmap. The functions geom_density_2d() or stat_density_2d() can be used to add 2d density estimate to a scatter plot. # Use stat_density_2d with geom = "polygon"
In this section, we’ll see how to connect observations by line. The economics data set [in ggplot2] is used. We start by creating a plot, named d, that we’ll finish in the next section by adding a layer. To customize the plot, the following arguments can be used: alpha, color, linetype, size and fill (for geom_area only). Learn more here: ggplot2 line plot. The ToothGrowth data set we’ll be used to plot the continuous variable len (for tooth length) by the discrete variable dose. The following R code converts the variable dose from a numeric to a discrete factor variable. We start by creating a plot, named e, that we’ll finish in the next section by adding a layer. To customize the plot, the following arguments can be used: alpha, color, linetype, shape, size and fill. Learn more here: ggplot2 box plot. Violin plots are similar to box plots, except that they also show the kernel probability density of the data at different values. To customize the plot, the following arguments can be used: alpha, color, linetype, size and fill. Learn more here: ggplot2 violin plot. To customize the plot, the following arguments can be used: alpha, color, dotsize and fill. Learn more here: ggplot2 dot plot. Stripcharts are also known as one dimensional scatter plots. These plots are suitable compared to box plots when sample sizes are small. To customize the plot, the following arguments can be used: alpha, color, shape, size and fill. Learn more here: ggplot2 strip charts. Data derived from ToothGrowth data sets are used. To customize the plot, the following arguments can be used: alpha, color, linetype and size. Learn more here: ggplot2 line plot. The diamonds data set [in ggplot2] we’ll be used to plot the discrete variable color (for diamond colors) by the discrete variable cut (for diamond cut types). The plot is created using the function geom_jitter(). To customize the plot, the following arguments can be used: alpha, color, fill, shape and size. The ToothGrowth data set we’ll be used. We start by creating a data set named df which holds ToothGrowth data. The helper function below (data_summary()) will be used to calculate the mean and the standard deviation (used as error), for the variable of interest, in each group. The plyr package is required. Using the function data_summary(), the following R code creates a data set named df2 which holds the mean and the SD of tooth length (len) by groups (dose). We start by creating a plot, named f, that we’ll finish in the next section by adding a layer. geom_pointrange() for creating an interval represented by a vertical line, with a point in the middle. We’ll use the data set named df2, which holds the mean and the SD of tooth length (len) by groups (dose). Cross bar with multiple groups: Using the function data_summary(), we start by creating a data set named df3 which holds the mean and the SD of tooth length (len) by 2 groups (supp and dose). The data set df3 is used to create cross bars with multiple groups. For this end, the variable len is plotted by dose and the color is changed by the levels of the factor supp. A simple alternative to geom_crossbar() is to use the function stat_summary() as follow. In this case, the mean and the SD can be computed automatically. To customize the plot, the following arguments can be used: alpha, color, fill, linetype and size. Learn more here: ggplot2 error bars. We start by creating a plot, named f, that we’ll finish next by adding a layer. To customize the plot, the following arguments can be used: alpha, color, linetype, size and width. The arguments xmin and xmax are used for horizontal error bars. To customize the plot, the following arguments can be used: alpha, color, linetype, size and height. We’ll use the data set df2. To customize the plot, the following arguments can be used: alpha, color, linetype, size, shape and fill (for geom_pointrange()). It’s also possible to combine geom_dotplot() and error bars. We’ll use the ToothGrowth data set. You don’t need to compute the mean and SD. This can be done automatically by using the function stat_summary() in combination with the argument fun.data = “mean_sdl”. We start by creating a dot plot, named g, that we’ll finish in the next section by adding error bar layers. The function geom_map() can be used to create a map with ggplot2. The R package map is required. It contains geographical information useful for drawing easily maps in ggplot2. In the following R code, we’ll create USA map and USArrests crime data to shade each region. To customize the plot, the following arguments can be used: alpha, color, fill, linetype and size. Learn more here: ggplot2 map. The mtcars data set we’ll be used. We first compute a correlation matrix, which will be visualized using specific ggplot2 functions. We start by creating a plot, named g, that we’ll finish in the next section by adding a layer. geom_raster(): High-performance rectangular tiling. This is a special case of geom_tile where all tiles are the same size. We’ll use the function geom_tile() to visualize a correlation matrix. To customize the plot, the following arguments can be used: alpha, color, fill, linetype and size. Learn more here: ggplot2 correlation matrix heatmap. geom_ribbon(): Add ribbons, y range with continuous x values. geom_rect(): Add a 2d rectangles. To customize the plot, the following arguments can be used: alpha, color, fill, linetype and size. The following R code uses econimics data [in ggplot2] and produces path, ribbon and rectangles. To customize the plot, the following arguments can be used: alpha, color, fill (for ribbon only), linetype and size. To customize the plot, the following arguments can be used: alpha, color, linetype and size. Learn more here: ggplot2 add line segment. The function labs() can be also used to change the legend title. Note that, \n is used to split long title into multiple lines. To change the appearance(color, size and face ) of labels, the functions theme() and element_text() can be used. The function element_blank() hides the labels. Change legend titles: Scale functions (fill, color, size, shape, …) are used to update legend titles. Learn more here: ggplot2 title: main, axis and legend titles. # Change legend position: "left","top", "right", "bottom", "none"
Learn more here: ggplot2 legend position and appearance. ToothGrowth and mtcars data sets are used in the examples below. Learn more here: ggplot2 colors. mtcars data is used in the following examples. Learn more here: ggplot2 point shapes, colors and size. annotation_custom(): Static annotations that are the same in every panel. These annotations are not affected by the plot scales. Learn more here: ggplot2 text: Add text annotations to a graph. Learn more here: ggplot2 line types. Learn more here: ggplot2 themes and background colors. p + coord_cartesian(xlim = c(5, 20), ylim = (0, 50)): Cartesian coordinates. The Cartesian coordinate system is the most common type of coordinate system. It will zoom the plot (like you’re looking at it with a magnifying glass), without clipping the data. With clipping the data (removes unseen data points): Observations not in this range will be dropped completely and not passed to any other layers. Expand the plot limits with data: This function is a thin wrapper around geom_blank() that makes it easy to add data to a plot. Learn more here: ggplot2 axis limits. Note that, date axis limits can be set using the functions scale_x_date() and scale_y_date(). Read more here: ggplot2 date axis. p + scale_x_log10(), p + scale_y_log10() : Plot x and y on log10 scale, respectively. p + scale_x_sqrt(), p + scale_y_sqrt() : Plot x and y on square root scale, respectively. # face can be "plain", "italic", "bold" or "bold.italic"
Learn more here: ggplot2 Axis ticks: tick marks and labels. Learn more here: ggplot2 add straight lines to a plot. Learn more here: ggplot2 rotate a graph. Facets divide a plot into subplots based on the values of one or more categorical variables. p + facet_grid(supp ~ . ): Facet in vertical direction based on the levels of supp variable. p + facet_grid(. ~ supp): Facet in horizontal direction based on the levels of supp variable. p + facet_grid(dose ~ supp): Facet in horizontal and vertical directions based on two variables: dose and supp. # Facet by two variables: dose and supp. By default, all the panels have the same scales (scales=“fixed”). They can be made independent, by setting scales to free, free_x, or free_y. Learn more here: ggplot2 facet : split a plot into a matrix of panels. Note that, each of these position adjustments can be done using a function with manual width and height argument. Learn more here: ggplot2 bar plots. p + coord_cartesian(xlim = NULL, ylim = NULL): Cartesian coordinate system (default). It’s the most familiar and common, type of coordinate system. p + coord_fixed(ratio = 1, xlim = NULL, ylim = NULL): Cartesian coordinates with fixed relationship between x and y scales. The ratio represents the number of units on the y-axis equivalent to one unit on the x-axis. The default, ratio = 1, ensures that one unit on the x-axis is the same length as one unit on the y-axis. p + coord_flip(…): Flipped cartesian coordinates. Useful for creating horizontal plot by rotating. p + coord_polar(theta = “x”, start = 0, direction = 1): Polar coordinates. The polar coordinate system is most commonly used for pie charts, which are a stacked bar chart in polar coordinates. p + coord_trans(x, y, limx, limy): Transformed cartesian coordinate system. coord_map(): Map projections. Provides the full range of map projections available in the mapproj package. limx, limy: limits for x and y axes. factoextra: factoextra : Extract and Visualize the outputs of a multivariate analysis. factoextra provides some easy-to-use functions to extract and visualize the output of PCA (Principal Component Analysis), CA (Correspondence Analysis) and MCA (Multiple Correspondence Analysis) functions from several packages (FactoMineR, stats, ade4 and MASS). It contains also many functions for simplifying clustering analysis workflows. Ggplot2 plotting system is used. ggplot2 - Easy way to mix multiple graphs on the same page: The R package gridExtra and cowplot are used. GGally: GGally extends ggplot2 by providing several functions including pairwise correlation matrix, scatterplot plot matrix, parallel coordinates plot, survival plot and several functions to plot networks. ggRandomForests: Graphical analysis of random forests with the randomForestSRC and ggplot2 packages.